This year our Thanksgiving Day is going to be a little different. We will be driving in the car to get to Michael's house in Virginia. I really love Thanksgiving because I love to cook, and I also really know how to cook a nice Thanksgiving meal without using any recipes unless I want to. Turkey is .39 a pound, which is about as cheap as any kind of meat gets these days. 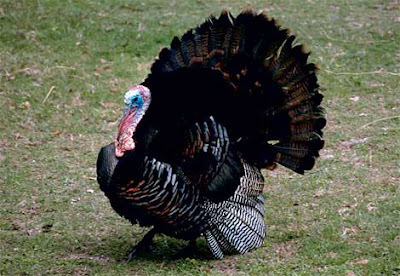 George and I are going out today to buy a frozen turkey or two, and put them in the freezer. A good turkey meal is nice at any time. Because I like to cook, I am making some road food for us to take on our trip. I'm not sure what this will be yet, but one idea is shrimp and vegetables and sushi. We'll also have gouda and swiss cheese with crackers, cut up vegetables and dip, cubes of cantaloupe, strawberries, and home-made oatmeal cookies. My goal is that we won't have to stop to eat any road food, but will be totally self-sufficient. The road food on the way from Boston to Washington DC isn't anything to brag about. There are McDonalds on the Mass Pike, and not much at all through Connecticut, and the New Jersey Turnpike is the worst. Connecticut does have one nice deli not far off the highway, but for the most part the trip is all hamburgers, fried chicken and other stuff that's not good for you. The exception is the three or four Starbucks we pass and where we often stop for a break. My plan is that we won't be hungry enough to stop and eat the wrong things because we'll be happily munching on shrimp, fruit, and sushi. I will keep the food cool in a cooler in the back seat, and since it is winter anyway, we don't have to worry that the food will get too warm. We will have juice and soda and plenty of bottled water on ice. Actually this is starting to sound delicious. Both of us have to work on Wednesday, so we don't have much choice anyway. I will miss the big turkey dinner, I know, but we will have that again when we get home. In the meantime, it will be wonderful to see Mike and Michelle again, and there's lots of fun to be had at their house. We plan to go out for a big Korean dinner, and I'm really looking forward to that. Happy Thanksgiving. How do you say "gobble gobble" in Korean? Have a good day. Simba says hi. He is hanging over my shoulder right now. I went to visit my mother in Oklahoma for seven days. We had a good time being together, but I am happy to be home and back to my routine. The kitties are doing great and I missed them a lot. I found myself doing a lot of knitting at my mom's house because she goes to bed very early. I made a pair of socks for her and two black hats. I gave one of the hats to a friend at work, and kept the other one for myself. I wish I had enough time to do all the crafts I want. I have jewelry to make, and hats to knit, and a ton of other things I'm interested in as well. I'm not sure how I got so crafty, but there it is. The kitties are using George as a cat bed. All three of them slept together on the couch this afternoon while I worked on a scarf that will be a Christmas present for someone (it's a secret). I'm almost finished with that, and I bought the yarn for the next project, a hat for my mom. It's a rainy day and perfect for knitting and I am enjoying being in my own home. Where, by the way, cats rule!